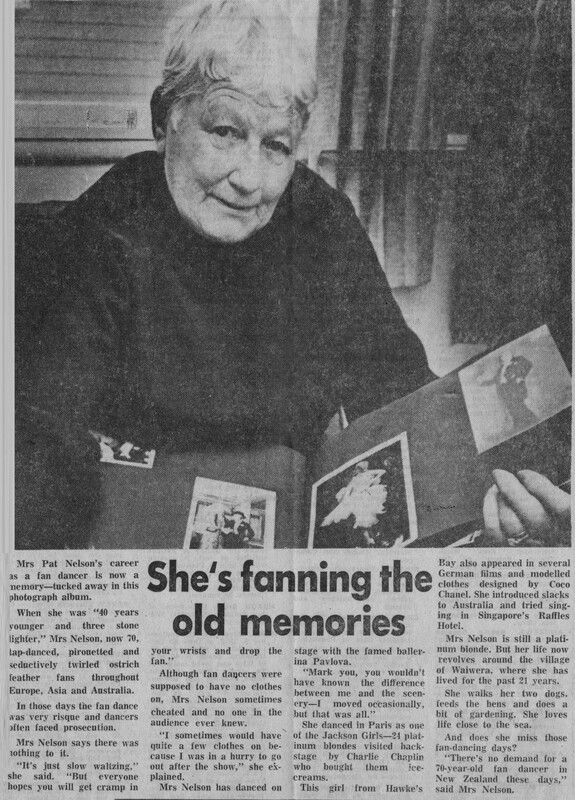 Mrs Pat Nelson’s career as a fan dancer is now a memory – tucked away in this photograph album. When she was “40 years younger and three stone lighter,” Mrs Nelson, now 70, tap-danced, pirouetted and seductively twirled ostrich feather fans throughout Europe, Asia and Australia. In those days the fan dance was very risque and dancers often faced prosecution. Mrs Nelson says there was nothing to it. Although fan dancers were supposed to have no clothes on, Mrs Nelson sometimes cheated and no one in the audience ever knew. “I sometimes would have quite a few clothes on because I was in a hurry to go out after the show,” she explained. She danced in Paris as one of the Jackson Girls – 24 platinum blondes visited backstage by Charlie Chaplin who bought them ice-creams. This girl from Hawke’s Bay also appeared in several German ﬁlms and modelled clothes designed by Coco Chanel. She introduced slacks to Australia and tried singing in Singapore’s Raffles Hotel. Mrs Nelson is still a platinum blonde. But her life now revolves around the village of Waiwera, where she has lived for the past 21 years. She walks her two dogs, feeds the hens and does a bit of gardening. She loves life close to the sea. And does she miss those fan-dancing days? “There’s no demand for a 70-year-old fan dancer in New Zealand these days,” said Mrs Nelson.